It's official. 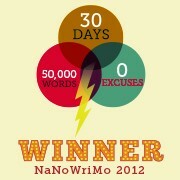 I have completed over 50,000 towards my novel, and that makes me a NaNoWriMo winner. And what did I win? A lovely certificate with my name on it (which I've printed out), the authorized use of a NaNoWriMo winner's badge (to your left), and bragging rights. This year I signed up for NaNoWriMo: that's National Novel Writing Month. It's taken place each November for the past 14 years. The challenge: to write 50,000 words (about 175 pages) towards a new novel in 30 days time. I don't generally need incentives to write novels. I've published three, have four more in my files, and am currently in the middle of writing my eighth. * My problem is that I compose new fiction very slowly. I've written about this before. I am much happier revising than creating from scratch — that's shaping what's already on the page, work that I enjoy. Getting ideas in my head onto paper is hard. Until I've written it down, an idea is an unformed possibility. It's a series of images that I see taking shape. The act of writing fixes the image in time and space, like a written snapshot. My job is to not only describe each snapshot of my story, but make the story flow from one to the next in a way that makes sense. I can easily spend half an hour thinking of different ways a story might flow, to get from one snapshot to the next, and not have written a single word. So, this latest novel I've been working on is about half-written. Maybe more, maybe less. I probably have another 50,000 words or so to go. I figure that if I am forced to get 50,000 words down in 30 days towards this novel, I have a good shot at finishing a rough draft before the year's end. But, it turns out, that finishing a half-written novel doesn't comply with NaNoWriMo's rules. They state pretty clearly: "Start from scratch. None of your own previously written prose can be included in your NaNoWriMo draft." Fortunately, the good folks at NaNoWriMo have given me a way out. Even if I've already written half my novel, I can still join. I'm just a rebel, in their parlance, and I'm welcome aboard. They even have a section in their Forum just for folks like me. Check my blog. It'll keep you posted on my progress. Last night I attended the 11th annual award celebration for the New Voices in Children’s Literature: Tassy Walden Awards at the beautiful Blackstone Library in Branford, Connecticut. We were treated to a warm welcome by our master of ceremonies, Doe Boyle; inspiring speeches by agent Julie Just, with Janklow & Nesbit, and by author Cat Urbain; and excerpts of the winning entries read by their authors. My favorite words of wisdom for the evening came from Ms. Just. She told us to cultivate that thing inside of us that is original, that is ourselves. It is worth standing above the fray and not being just like everyone else. That’s what people look for. And as Cat Urbain emphasized, don’t give up: the world will eventually recognize true spark and embrace it. this year’s finalists: Jordan Fenster, Maribel Girnius, Paula Wilson (picture book text); Jennifer Edwards, Natalie Fifer, Katherine Kopcha (illustrated picture book); Karen Lindeborg, Kate Lynch, Traci Grigg, Heather DiLorenzo (middle grade novel); and Leslie Cahill-Milford (young adult novel).